I love dive watches. The majority of my collection are divers, but I cant get enough. There are tons of divers out there, great ones, nice ones, and a lot of crap. While searching the net for what’s new out there, I came across Marc & Sons. I admit that I was not familiar with this brand (as you may not be) so I had to take a look. They have a pretty good selection of divers, pilots, and vintage style watches. 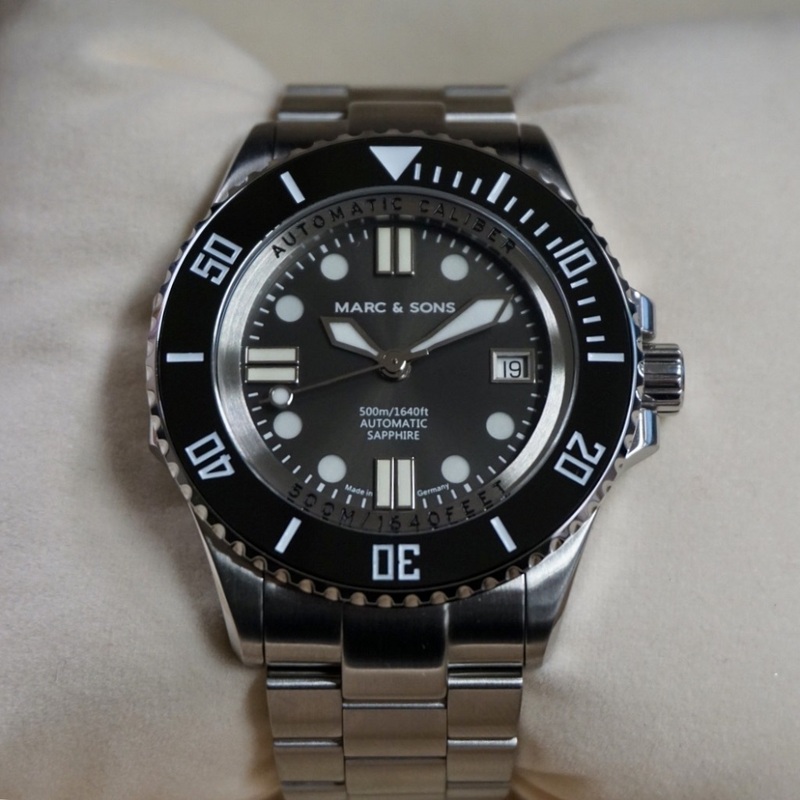 All are very nice, but it was their newest model that really stood out – the Marc & Sons 500m Diver. What made this stand out is that they are Made in Germany and have a Swiss ETA 2824-2 movement (both details very good starting points). I had to get this on my wrist, so I contacted Marc & Sons and they were kind enough to send me out one to review. Lets check this thing out. If you are a fan of Rolex like me, you will notice right away this Marc & Sons 500M Diver is heavily inspired by the Rolex Deepsea. Now although it shares a lot of elements with the Deepsea there are enough differences that makes this watch unique. First off there is the color. This model has a very cool gun metal grey which just looks so different and works so well with the stainless steel. The hour makers at 6,9, and 12 o’clock are large double bars unlike Rolex, and the rest are circular markers, like the Rolex. The date is positioned at the 3 o’clock and is very legible. Hour and minute hands are both tapered unlike the Rolex Mercedes/index hands. These hands are connected to the very reliable Swiss ETA 2824-2 automatic movement. One detail which is just like the deep sea is the large ring around face of the dial. I really like the look of that. Adds a step down effect from the bezel to the face. Made from 316L brushed stainless steel, the case on this Marc & Sons 500M diver is very solid and nicely finished. The bezel is a standard 120-click unidirectional and has pretty much no play to it. The bezel insert is black ceramic and shares the same layout with the Deepsea minus the lumed dot at the 12 o’clock position. Most of the case is brushed (with a few polished details) which adds a nice visual look. Water resistance is an incredible 1640 feet which is commercial diver territory. Now if course if you were a commercial diver doing saturation diving and breathing helium you would appreciate the helium valve on this case. At depth the helium will make its way into the case and when ascending that helium will expand. The helium valve will enable that expanding gas to escape and not damage the watch. For everyone else, well, it’s as extraneous of a detail as the 1640 WR rating is. In other words, overkill for your dip in the pool. Of all the watches I have comes across this has to be about the best lume I have seen. Everything that should be lumed is, and that blue glow is fantastic. Charge time is very quick and the glow last quite a long time. Swiss Superluminova BGW9 lume is used on everything needed to glow. This even glows in a lit room. This brushed stainless steel bracelet is not lightweight. Links are solid and very smooth. There has been no hair pulling at all which for me is great. The bracelet tapers slightly from 22mm down to 20mm. At 22cm in length this bracelet can fit just about any wrist. For my 6.5″ wrist I ended up removing 6 links and it fits me very well. Now on that note the clasp can feel a bit large on a small wrist especially after removing most of the links to fit. The clasp is large but I was able to get used to it pretty quick and the quality of the clasp is very good. This clasp is a locking clasp with a slide out divers extension. The sliding divers extension offers four micro adjustments which is great for the dive suit and also just when you need to loosen up from when the wrist swells a bit through the day. The quality of this watch is very impressive, much more then I expected. Considering that this has an ETA movement, ceramic bezel, helium escape valve, and sapphire crystal, with a price of only 454 euros or approx. $555 USD this is an incredible deal. Everyone I showed this watch to has made price guesses of over a thousand dollars. So if you love the Rolex Deepsea but don’t have over $12,000 to buy one then you should look into this Marc & Sons 500M diver. You can check them out at marcandsons.de. What I’d change: Maybe go with a less bulky clasp. The best thing about it: Quality of that ceramic bezel.